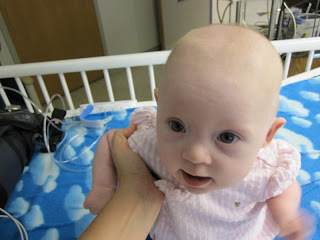 It is with a heavy heart that I communicate that Josie was admitted to the hospital today due to breathing difficulty. She developed a deep retraction in the center of her chest, compounded by a terrible sound called a "stridor" and falling oxygen saturation levels. She is receiving breathing treatments and is now on a high-flow nasal cannula while the pulmonologists collaborate with the cardiologists to try and figure this out. We've been through hell with this little lovebug and maybe it makes you stronger but mostly it makes you not want to go back to that dark and discouraging place. Please join me in praying that this is a minor problem with a quick and easy solution and that Josie moves forward in good health. The prayers got us through the adoption process, and through the open heart surgery, and though the most recent hospitalization and I know they can get us through this. Praying for your little sweetie!! Ugh, Elizabeth and Travis, it pains me to hear this. That little girl of yours is so precious and such a fighter. She is so lucky to have you as parents. I hope and pray that the physicians can solve Josie's breathing problems and that this will be the last of the hospital visits! We are so sorry to hear she is back in the hospital. Praying right away for all of you. Praying this resolves quickly! Give em' hell Josie! I'm praying for you all. Hopefully it's something simple like croup. Maybe she just got a virus and this is how she reacts. 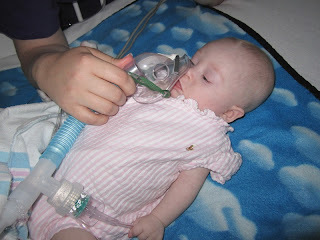 With croup, stridor often follows, especially with babies with Down syndrome since they're little airways are just a smidge smaller than the average baby. Epi breathing treatments help reduce the swelling (you can't give them at home, however, because the heart rate always has to be monitored too), therefore opening up the airways and making breathing easier. I'm not sure why I write all this but I am hopeful it is something simple as in and in and out admission so she can get back to loving the ceiling fan. My heart goes out to you. Sweet Sweet Josie, praying for your precious body to heal and for strength and understanding for Mom and Dad during these very emotional and physical trying times. Lifting Josie up in prayer! God Bless her! Poor little baby. And poor little Mama. So hard. I'm praying. Hang in there. So sorry to hear this! Definitely will be praying for you all! Praying for quick walking papers and easy answers for your love bug. I so understand what you are saying about that smile through all the "stuff".While Zoey was undergoing treatment for leukemia,her smile seldom was not present.I was thrilled for that but there was also something heart wrenching about it as well. Ugh baby girl, get better soon. Stridor sounds like airway issues, not lung issues. Which would probably be good because it means its not PH. Hopefully its just a cold. I can't believe that Jax still smiles after everything and his many long hospital stays. Even when I give him a shot twice a day he still smiles! Oh no... I'm sorry to hear this. Will be praying! Praying for you sweet Josie girl!!! 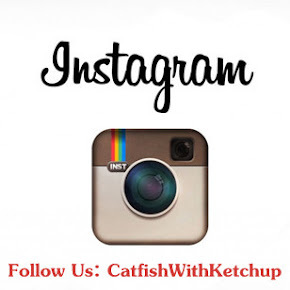 Praying for you Catfish with Ketchup..
Lord, heal the sweet baby girl. Praying praying praying!!!! For the Lord's healing hands to comfort sweet Josie! Prayers and Positive Thoughts to you and Josie!!!!! Praying for your little peanut Josie!!! prayers for your sweet lil poodle- oh gosh- cold and flu season is so hard on the lil ones.